"A plant is a weed only within a certain context; one person’s weed is another person’s wildflower. Simply expressed, a weed is any plant that grows where it isn’t wanted. Weeds are defined by their tendency to flourish at the expense of a gardener’s overall vision, and we tend to battle their presence in our yards. It is interesting to consider, though, that a plant is a weed only within a certain context, which is to say that one person’s weed is another person’s wildflower. Most of us have pulled at least one dandelion up by its roots and disposed of it in the interest of preserving the look of a perfect green lawn, yet the dandelion is good medicine, packed with healing properties and vitamin-rich leaves that are a delicious, spicy surprise in a summer salad. The next time you see a weed, you might want to look deeply into its roots, discover its name, its habits, and its possible uses. Instead of seeing an unwanted intruder, you might see a healer offering its leaves for a medicinal tea or its flowers for a colorful salad. At the very least, if you look long enough, you will see a messenger from the wilderness of Mother Earth, reminding you that, even in the most carefully controlled garden, she cannot be completely ruled out." 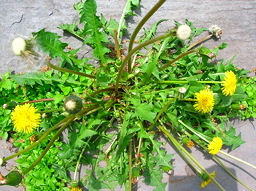 This entry was posted on Monday, January 09, 2012 and is filed under dandelions, Mother Nature, weeds, wildflowers . You can leave a response and follow any responses to this entry through the Subscribe to: Post Comments (Atom) .